The apt cache is not updated after modifying or adding sources in software-properties. 4) With the package from proposed you should receive a dialog indicating that "The information about available software is out-of-date"
I reinstalled Ubuntu 12.04.1 LTS. After select the right server in "software sources", Ubuntu does not automatically update the apt cache. Without manually updating the apt cache, I cannot find some packages that I want to install. 1. Reinstall Ubuntu or any of its derivatives. 2. Run the software center. 3. At the top, go to Edit -> Software Sources, select the server you want to use. 4. You will see nothing happened. 5. Try find the package "build-essential", or just any package you want to install. If you cannot find the package, that means the software center either not updating the cache automatically or not updating the xapian apt search index or both. Attached here with a screenshot. 1. Select a server in "Software Sources" (as stated in step number 3 above), if you haven't do so. Then, close the "Software Sources" window. 2. Manually run the "sudo apt-get update" command. 3. Run the "sudo update-apt-xapian-index -f" command. Then, you can find the package you want to install. This problem also occur with previous version (version 11. **) of Ubuntu. This bug makes it very difficult to write easy-to-follow instructions for adding software in non-default repositories. What I think is needed is a GUI button or menu item in Ubuntu Software Center which does something similar to "sudo apt-get update && sudo update-apt-xapian-index -f". This still happens in 13.04. 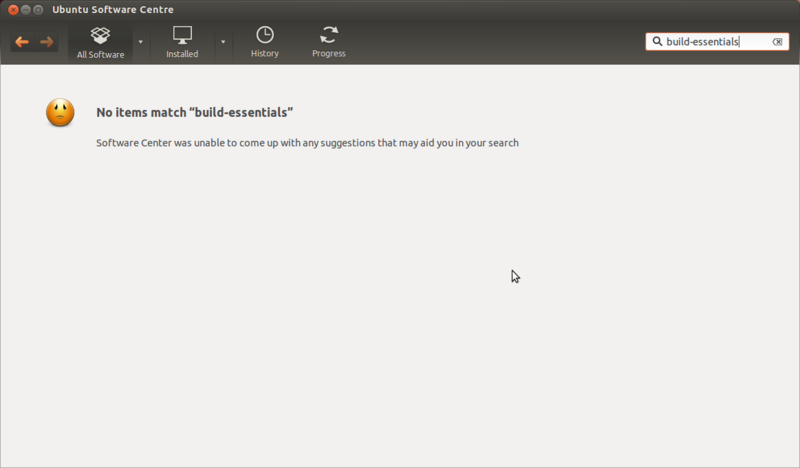 It has been a problem in Ubuntu Software Center as far as I can remember. I can confirm that this bug still exist in Ubuntu 13.04. So, developers, please do something. When can I expect this bug to be fixed? - index automatically, caused some packages cannot be found. Developers, look at the comment I added to Bug #782953 (I could paste it here too). I've commited a fix and proposed a merge. I've tested it locally and it seems to work well (not extensive tests). The fix also fixes Bug #782953 indirectly. Accepted software-properties into saucy-proposed. The package will build now and be available at http://launchpad.net/ubuntu/+source/software-properties/0.92.27.1 in a few hours, and then in the -proposed repository. I installed software-properties-gtk version 0.92.27.1 from saucy-proposed and confirm that the cache is refreshed after making changes to which sources are used. Accepted software-properties into saucy-proposed. The package will build now and be available at http://launchpad.net/ubuntu/+source/software-properties/0.92.28 in a few hours, and then in the -proposed repository. I installed today software-properties 0.92.28 and I can confirm that after changing any of the sources (disabling multiverse, changing mirror or adding PPA) I get a dialog stating that software sources need to be refreshed. This bug was fixed for Saucy (and future), but what about older releases (especially LTS)? Yes, a merge proposal against ubuntu/precise-proposed/software-properties is the correct way to proceed. If you do submit one add me (brian-murray) as a reviewer and I'll ensure that it gets uploaded to Precise. Thanks! Ok. Thank you! I'll start doing this now (first for Precise, then others). Done. Proposed the fix for Precise, Quantal and Raring (I guess). Thanks for adding merge proposals for Quantal and Raring, I'm not certain its worth the work (reviewing, approving and verifying) of creating Stable Release Updates for those two releases though. Yes, you're probably right. The support for those (non-LTS) releases will be over soon. Accepted software-properties into precise-proposed. The package will build now and be available at http://launchpad.net/ubuntu/+source/software-properties/0.82.7.7 in a few hours, and then in the -proposed repository. 2. select the server you want to use & select the software sources close button. 3. You will see nothing happened. enable precise-proposed & install software-properties-gtk package.